Zombies are dumb. They will fall for nearly every kind of booby trap that the living can devise. You don't even have to hide a booby trap from a zombie. You don't even need to use explosives or firearms in Zombie killing traps. Large quantities of zombies can be stopped or killed using gravity and pit traps or falling rocks. Since they aren't conscious, thinking, beings, Zombies can't reason their way out of a simple trap or think ahead to avoid traps and obstacles. 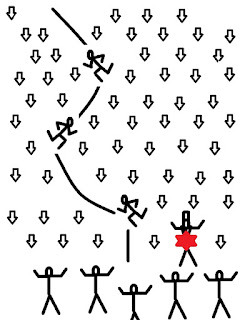 While they may follow the path of least resistance when they roam, Zombies in single-minded pursuit of humans can easily be led to fall into pits or impale themselves on spikes. This is a big advantage that humans have over zombies. Impaling Trap. One easy way to stop Zombies is to arrange angled spikes in their path. 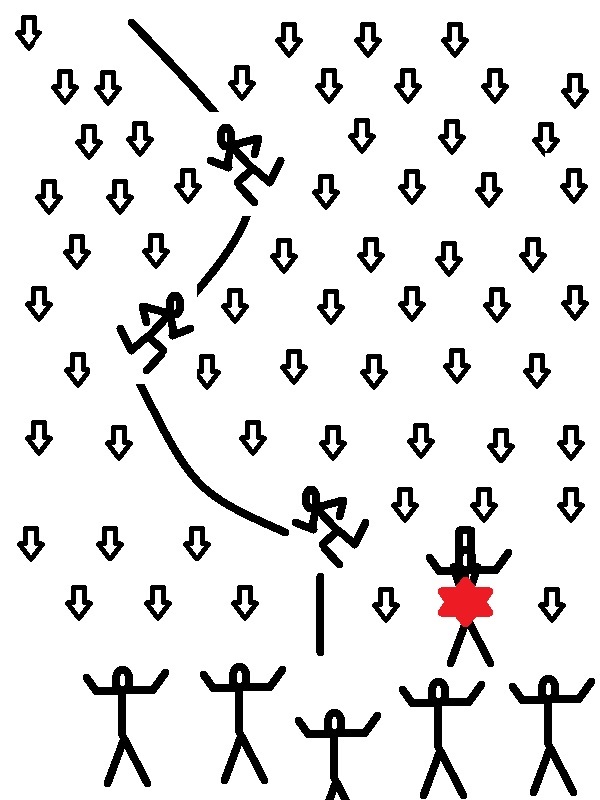 People can easily navigate their way through a spike obstacle, but Zombies will move mindlessly forward and impale themselves on the spikes. While the actual construction of a spike trap is beyond the scope of this blog and is probably a very bad idea, the earthen fortifications at the Yorktown battlefield in Virginia are a good illustration of a spike trap. On The Walking Dead, the character Morgan Jones is initially driven beyond the edge of sanity by the loss of his family. For a time, he lives in a fortified area of a small down that is surrounded by impaling booby traps that regularly snag Zombies who wander into his living space. Finally, in our modern society, wrought iron fences with spiked fence posts regularly impale drunken burglar-Americans who attempt to trespass. After a Zombie apocalypse, such fences will likely immobilize some portion of Zombies who attempt to get over them. How Can I Hide From Zombies? Can You Hide From Zombies? You can fight Zombies. You can run from Zombies. But, can you hide from Zombies? It's a good question. On AMC's The Walking Dead, you can hide from Zombies both visually and by disguising your human scent with the scent of zombies. However, as with most things Zombie, your mileage may vary. In fiction, authors and scriptwriters have a variety of mechanisms for Zombies to sense living humans and home in on them. Can they hear you breath? Can they smell your living scent? Can they somehow sense your vital life force? If you ever find yourself in a real life Zombie Apocalypse scenario, you will have to conduct Zombie Recon missions and observe real Zombie behavior to find out. Personally, I like the way the Zombies on The Walking Dead operate. They do not seem to have supernatural powers. They primarily use their eyes and their ears to detect humans. However, the scent of smell comes into play in several episodes when the characters were able move through large groups of Zombies by covering themselves in the smelly, rotten, entrails of the deceased. This convention makes logical sense in that the Zombies do not have reasoning, conscious minds, and don't make fine distinctions or use tactics. Since they don't eat each other, the sense of small must be at play. Tips for Hiding from Zombies! 1. Hide from Sight. Use camouflage, terrain, and artificial barriers to keep out of sight and be hard to see in the open. Since sight seems to be the primary scent that Zombies use to acquire targets, it would make sense that camouflage would make it hard for zombies to see you. 2. Extinguish Light Sources. In The Walking Dead, Zombies are attracted to light and flame. As early as Season 1, characters learned to keep lights dim and shielded lights in order to avoid attention from Zombies. They hung heavy blankets over house windows to keep light from escaping. 3. Minimize Sound. Noise attracts Zombies. Louder noises attract even more Zombies. This is one reason to use knives and axes whenever possible instead of firearms. 4. Remain Still. People notice motion. Therefore, it makes sense that Zombies would also notice motion and be attracted to movement. If you see Zombies and they don't see you, you should avoid any sudden movements that might attract their attention. 5. Keep smells to a minimum. If Zombies can sense humans using their sense of smell, it would make sense to keep all smells to a minimum. Cooking odors and smoke from camp fires might attract Zombies as well. 6. Disguise your smell when in close proximity to Zombies. If the Zombies are really close to you, it might make more sense to smell like a Zombie than a human. The characters in The Walking Dead might well be onto something. Maybe you could disguise your smell with the scent eliminator used by hunters? Maybe you should cover yourself in Zombie guts? On the other hand, Zombies might be able to distinguish between the living and dead using their eyes. The big question: Do you feel lucky?